Emily loves caring for animals. While we were vacationing in Branson, we all had the opportunity to feed baby animals at the Promised Land Zoo. (Watch for my review soon.) She loved it! 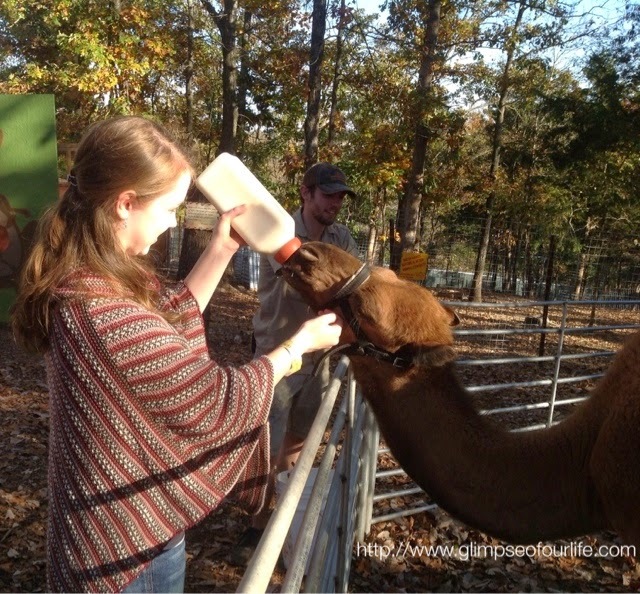 We all did, and when Emily heard we could go back and feed the animals again that afternoon, she said she wanted to feed the baby camel. It was so fun seeing the excitement of my kids experiencing something so rare. I think I got just a glimpse of heaven...that we can't even imagine the things God has prepared for us! I love that verse and I can't just imagine how wonderful Heaven will be. Well actually, I can't. I'll just have to wait. Psalm 18:1, I will love thee, O Lord, my strength. Sweet picture and what a cool opportunity to feed the animals! I don't think I've ever seen a baby camel before - Cute! "When we all get to heaven, what a day of rejoicing that will be..."